The FME Data Inspector has a number of miscellaneous functions that help users navigate through data, investigate data, and even translate data to a different format! Press the Shift key on the keyboard and it will activate the zoom-in tool in the Inspector. Press the Ctrl key and it will activate the zoom-out tool. Release the key to revert to the previous tool. This functionality allows users to quickly move between query and navigation modes at the press of a key, so there’s no need to click between query and navigation tools on the menubar or toolbar. The FME Data Inspector save tool lets you save whatever data is currently being displayed in the view window. The data can be saved in any FME-supported format of your choice. Simply select File > Save Data As to open the prompt for saving data. File > Save Selected Data As saves only the data that is currently selected in the view or table view windows. Data in the View window can be filtered by a set of user-defined criteria to show only the features that are required at the time. This functionality is activated by Tools > Filter Features on the menubar. 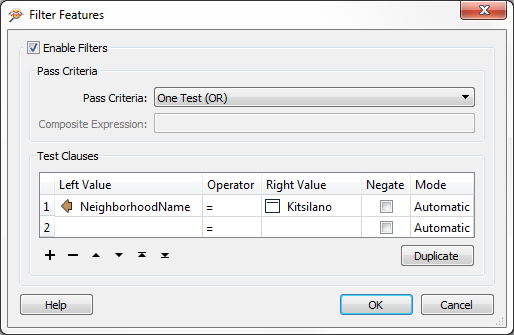 The Filter Features dialog allows a whole series of test clauses to be set up, using a number of operators to test the values of source data attributes. For example, here the user is filtering (keeping displayed) all features that are located in the neighborhood of Kitsilano.